Just in time for Christmas gift giving! Only 3 ingredients used in my pistachio bark. 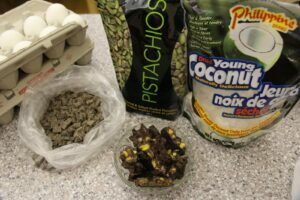 Melt 1.5 cups dark chocolate nibs in a double boiler (I use a premium quality baking chocolate), add 1 cup of roasted salted pistachio nuts, and crumble about half a cup of young coconut chunks into the melting chocolate. Blend together until chocolate is melted. Pour melted mixture onto waxed paper and flatten out with spatula. Chill outside or in freezer for 1 hour. For a change if you don’t like coconut, you can add dried blueberries or cranberries to this instead and it is just as yummy! No eggs were used – they just were in the photo for no real reason!